Brainy books aren’t for everyone, but if you’re one of those who love everything “brain” including how your brain works, how it perceives and relays those perceptions to you, and how—in many ways—it works you like a puppet on a string, there’s a new picture book just for you. 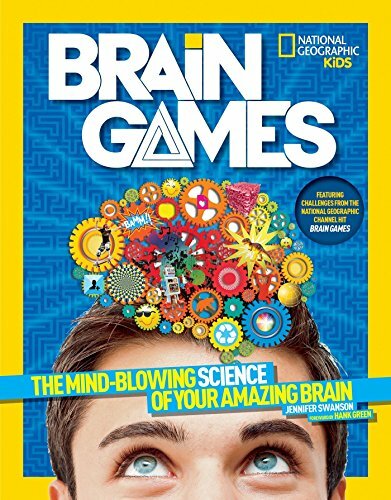 It is National Geographic Kids’ Brain Games: The Mind-Blowing Science of Your Amazing Brain, by Jennifer Swanson, and for lack of a better word . . . it’s amazing! Brain Games is written for children ages 8 to 12, but readers of all ages may find it a worthy challenge. Children learn how much the brain weighs, how it’s divided into sections, what each section does, and how much energy is used in the process. They learn how the brain processes thoughts, where it stores memories, and even why some songs sometimes get stuck in it. This book is over 100 pages of fun. It offers clever brain challenges, activities designed to give the brain a much-needed break, and even explains how the Rubik’s Cube can actually improve the thinker’s life. It explains what “revs up our engines” or causes a surge of emotion, how many decisions the brain makes a day, and why stress can make a person forget things. It also explains how, like a “puppet on a string, the brain regulates many of our body’s functions with or without our input or approval, like blinking, remembering things, and dreaming,” to name a few. Any child with a question about his brain—or yours—should read this book. The text, though not super-advanced, will certainly push the 8 to 12 year old’s envelope. The pictures are vibrant and detailed, leaving nothing to the brain enthusiast’s imagination. The back matter includes a lengthy index, a detailed glossary, and a plethora of photo credits. There is also a bonus section that introduces Braille Code and several advertisements that entice students with the book covers of other brainy books that can be purchased. Great as a supplemental text, for in-depth classroom discussions, and also for independent study.